Need an after school adventure? Look no further than the Music City Star that travels from Wilson County to Riverfront in downtown Nashville. Don’t live east of downtown – make this an outing for a day out from school or some summer afternoon fun. 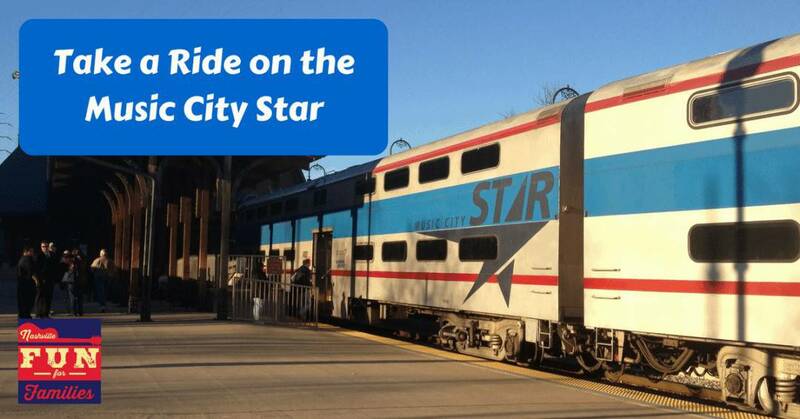 The Music City Star travels from Lebanon to Riverfront station stopping in Martha (off 109), Mt Juliet, Hermitage, and Donelson before arriving downtown. It is primarily set up for commuters with morning trains and afternoon trains with nothing in between. So, sadly, if you ride the train in the morning you would arrive at 8:15 AM and your first chance to go home is 4:10. But, if you go in on the first afternoon train you have 2 chances to catch the train back home. You can also just stay on the train and enjoy the ride if you don’t want to explore downtown. Single Ride tickets can be purchased at the ticket vending machines on the platforms (remember you need 2 to go and return). Each way is $5 unless you are traveling to and from Donelson which costs $2. Children age 4 and under are FREE. 🙂 If you plan ahead you can buy tickets at a discount at area Krogers for all stations and the Mt Juliet City Hall to board the train in Mt Juliet or the Lebanon City Hall to board in Lebanon. We purchased our tickets at the Kroger in Hermitage and it was $17 total for myself, Declan (8) and Tamzin (2). Go here for ticket locations. If you have a little one be sure to factor in how long you want to ride when you pick your boarding station. The time tables will give you an idea of how long it takes to get to downtown from each station. We have ridden from Mt Juliet (30 min) and from Hermitage (23 min) and for my kids’ attention spans the 23 minute ride was a better fit. We arrived at the Hermitage station about 15 minutes before the train was due to arrive. We actually sat in the car for 5 minutes to keep everyone safely away from the train tracks and the parking lot for a few extra minutes. You can see the train coming from a decent distance and ensure everyone is safely at the back on platform. We had plenty of time to board even though I was the only adult with the kids and a stroller. If you have a stroller – look in the window of the doors once you board the train. Every other carriage has an area for wheelchairs and strollers. The carriages have 2 levels. My kids always like to go upstairs. The seats at the top are all singles so you have to sit behind/ in front of your kids. The ride is pleasant and scenic. We saw horses, the Cumberland River and the different neighborhoods on the way into downtown. Once we arrived several people offered to help me get the stroller. Riverfront station is almost across the street from the base of Broadway. We always walk down Broadway and get ice cream at Mike’s. This last time we had time to walk down Second Avenue and see the sites and listen to the music from the street. The ride home is always more crowded than going into downtown because of the people going home from work. We have never had a problem getting a seat and everyone has been patient when Tamzin yells “Look over there!” loudly. When: Trains run week days from 5:45 AM to 9:15 AM and 3:20 – 6:35. Check schedule here. Cost: $2 – $5.25 per ride depending on length. Kids 4 and under FREE. Check costs here. Can you catch the train at one station and ride it round trip without getting off? If so how many tickets do you need to purchase and best time and place to start? Call the transit authority to double check me (615) 862-8833, but I believe tickets are one way so you would need two tickets. As for boarding, it depends on how long you want to ride. For the longest ride you’d start at the Lebanon station and then ride to Riverfront and back. 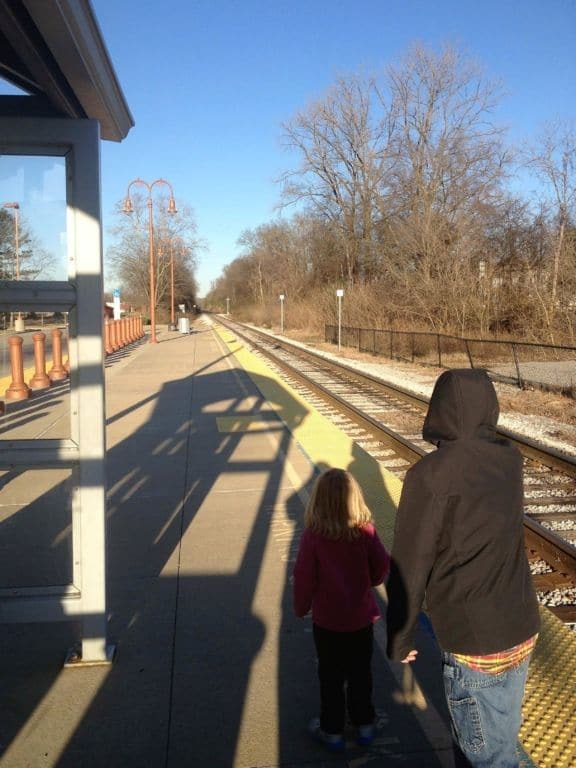 We usually ride from either Mt Juliet or Hermitage and get off downtown for ice cream and then take the next train home.